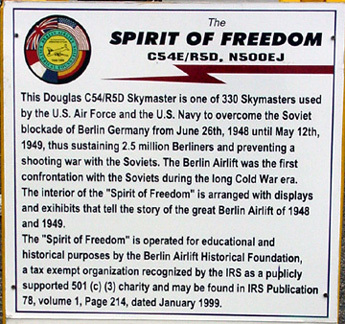 Wings & Wheels Expo 2001 -- "The Spirit of Freedom"
The "Spirit of Freedom" is a flying museum commemorating the Berlin Airlift of 1948-49 that broke the Russian strangle hold on Berlin. 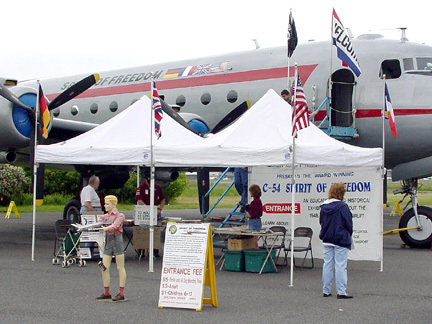 The plane is supported and maintained by your generous gifts and the sacrifice of many volunteers. 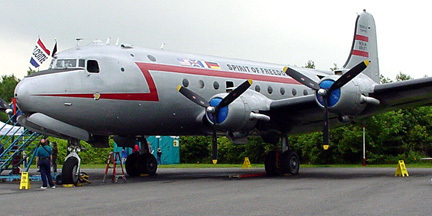 Captain Tim Chopp and his crew have flown the Spirit all of the the world since 1988, including a return visit to Berlin in 1998. The airframe has 26,520 hours.